The women refused to pay unreasonable taxes, then took their town to court and won! 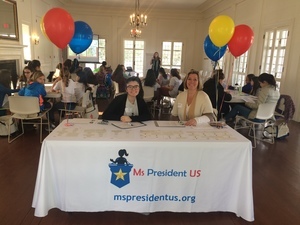 On March 16th, during a session titled, "Founding Mothers," the participants in the Ms President US program learned about powerful Connecticut women who shaped our country's history. Led by Lena Harwood Pacheco, Education Director for the Connecticut Women's Hall of Fame, the girls heard about the "Smiths of Glastonbury" who in 1872 were charged exorbitant taxes that applied only to single women. They opposed these taxes and objected to their inability to be able to vote to repeal them. Eventually, they won their case against the town, even though women didn't earn the right to vote until 1920. These stories -- along with many others about influential women in CT -- are important to girls who aspire to become leaders themselves some day. The Smiths of Glastonbury exemplify the role that women can play in addressing laws that do not sufficiently represent or protect all citizens equally. The session was held at Keeler Tavern Museum and hosted by its Executive Director, Hildi Grob, who is a member of the Ms President US Advisory Committee. “Strong women feature prominently in the stories told at KTMHC. From Esther Keeler to Anna Marie Resseguie to Julia Gilbert - they all left their indelible mark on history and shaped who we are today. We were delighted to host this session of MPUS,” said Ms Grob. Many of the 50 girls in the Ms President US program intend to run for President themselves and are busy preparing their campaigns for the Election on May 6, 2018 at The Ridgefield Playhouse. The community is welcome to attend, and more details will be shared closer to the date. Ms President US (MPU) is one of the nonprofit organizations under the Friends of Ridgefield Community Programs umbrella, a 501(c)(3). Its mission is to inspire and prepare girls to aim for the highest leadership positions and know they can achieve them.